Everyone loves a good show about sharks. And although CET and ThinkTV won’t be buying rights to Megalodon: The Monster Shark Lives any time soon, we ARE presenting a mini shark night on Wednesday, May 7. The first program, Nature: Shark Mountain, airs at 8pm on ThinkTV16 and CET. This program follows underwater filmmakers Howard and Michele Hall, who have spent 25 years diving and documenting the most remote and beautiful underwater locations, always learning something new about the fantastic creatures that live there. Yet even these remote places and creatures are at risk in today’s world; being able to share their experiences with the rest of us is increasingly important to the Halls, and to us. They take viewers along on the dive of a lifetime, to a tiny outpost 300 miles off the coast of Central America — Shark Mountain. The second program, NOVA: Why Sharks Attack, will start at 9pm also on CET and ThinkTV16. This show examines how, in recent years, an unusual spate of deadly shark attacks has gripped Australia, resulting in five deaths in 10 months. 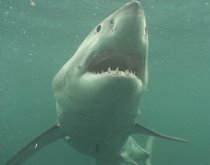 At the same time, great white sharks have begun appearing in growing numbers off the beaches of Cape Cod, Massachusetts, not far from the waters where Steven Spielberg filmed Jaws. What’s behind the mysterious arrival of this apex predator in an area where it’s rarely been seen for hundreds of years? Are deadly encounters with tourists inevitable? To separate fact from fear, NOVA teams with leading shark experts in Australia and the United States to uncover the science behind the great white’s hunting instincts. With shark populations plummeting, scientists race to unlock the secrets of these powerful creatures of the deep in their quest to save people — and sharks. Below is a preview for NOVA: Why Sharks Attack. Hope you can join us for our mini-shark night!